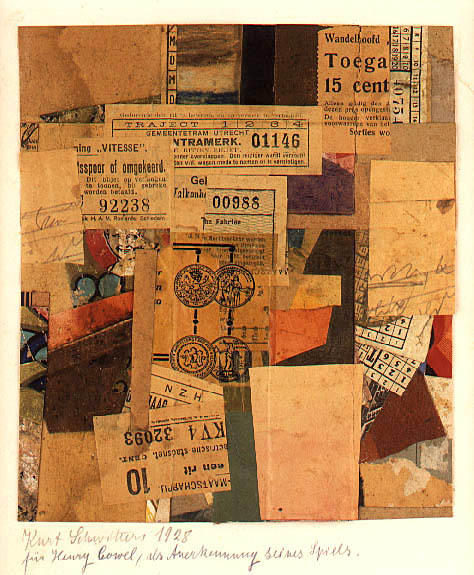 It happens that, right at the time I’m visiting San Francisco, the Berkeley Art Museum is hosting the first major exhibition in fifty years on the work of mockduck favorite Kurt Schwitters— master collagist, all-around loon. I went to the exhibition with old friend Alastair Johnston (shown here playing Thelonious Monk in Monk costume). We peered through the collages and noted old tram tickets, chocolate and tobacco wrappers (suggestive of a less-than-healty diet) and elements of what seemed to be a dissected croquet set. I was fascinated to discover that the smallest collages seemed to carry the most power: the impact of the larger ones seemed to dissipate slightly as one’s eye tracked around them; the smaller ones, meanwhile, had this boggling degree of carefully-wrought detail that seemed to squirm under one’s gaze. 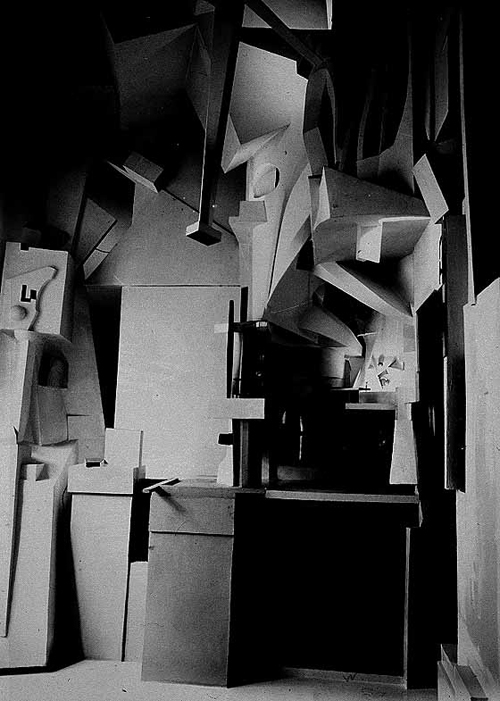 The Merzbau eventually overran the confines of Schwitters’ flat and — as legend has it — prompted him to get the upstairs neighbors evicted so he could knock out the ceiling and continue building his masterpiece. Naturally, the entire artifice got left behind when he fled Germany for Norway in 1937. (Alastair pointed out to me that probably many of the freestanding small sculptural pieces shown in the main exhibition space were just pieces that Schwitters couldn’t bear to leave behind and snapped off the Merzbau and stuffed in his suitcase or something). 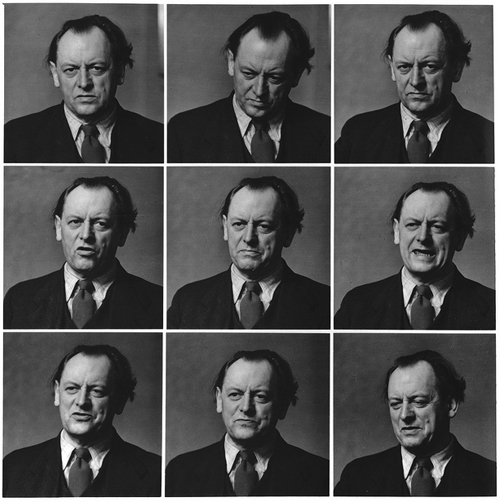 Later in his life, Schwitters started a second Merzbau in Norway (burnt down) and then a Merzbarn in England (unfinished at the time of his death). The exhibition curators have attempted to recreate the Merzbau from archival photographs and the descriptions of Schwitters’ surviving son. There was a distracting clicking on and off of lights (attempting to show you what it looked like in day vs. night), but otherwise, the recreation seemed as faithful to the original as one can possibly hope for. There were maddening details, like a stairway that seemed to round a corner and abruptly end— no one could tell what the artists’ intention was here (plus a student intern guard barked at you if you attempted to crane your neck around the corner to find out). After the exhibition, I did one my favorite stock Bay Area activities, the old Hike Up The Berkeley Fire Trail. This was a standby of mine when I would occasionally wake up on a Sunday overwhelmed with a feeling of tiredness towards the Mission. In triumphant vacation form this time, I managed to find a bench with a spectacular view at the very top of the hill range and promptly fall asleeep on it. I’ve never really found a friend who shares my toleration of Berkeley, but I could happily see just throwing every other aspect of my personality overboard and settling into a classic, cliche-riddled existence as Stereotypical Healthy Old Guy In Berkeley. Golden retriever, front yard, jogging— the works. It’s not like I actively see my life heading in this direction; more like I’d strongly consider diverting it from whatever that direction is if this was the reward. It would be difficult to shut off the critical faculties of one’s brain to swallow all the Berkeley malarky that you’d have to listen to all the time… but if you could master that one trick, you’d be all set in other regards.